We don’t currently have a dishwasher and there is simply never enough space in one rack to let everything drain so we have resorted to adding an absorbable mat alongside, and I worry this is not doing the worktops any good, being almost permanently damp. 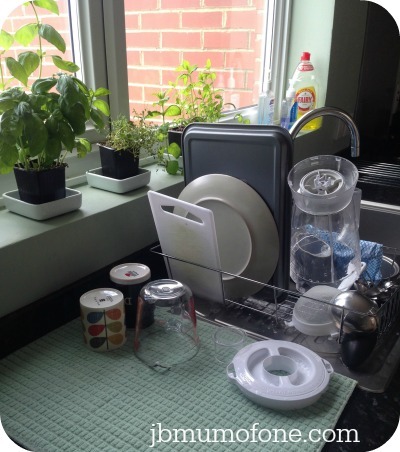 The Extend dish rack has tackled this problem perfectly and we were completely delighted when this arrived. 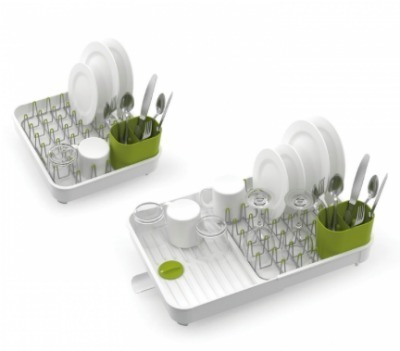 The dish rack extends to hold more items when needed, but can be closed back up when finished saving worktop space. Sloping base channels drain any water towards an integrated plug which can be set to trap water to drain later, or left open, as we do, to drain water instantly away into the sink. It has sturdy non-slip feet and raised ribs which prevents water from becoming trapped under glasses or bowls. It really is a very clever design and, of course, it has a certain style. We are really pleased with it and are delighted to get rid of the damp, soggy mat we were using previously. My only criticism is the price. I love the product. It is a great design, it is practical and stylish but would I spend £50 on it, no. I honestly wouldn’t spend £50 on ANY dish rack. I think the price point here is wrong but I can’t deny that it is a quality product. Disclosure: I was sent the Extend dish rack featured free of charge for the purpose of this review, however all opinions are my own and 100% honest. Oh i love this what a clever idea! I read this thinking “oh my life – this is exactly what I need” right up until I got to the price. I’m afraid I’m a Wilkos £5 dish rack kind of girl and whilst I could possibly double that figure to get something good, I’m definitely not able to go to 10 x that. Yikes! I really love Joseph Joseph products. They look great and are so clever and functional. I could do with one of these myself. 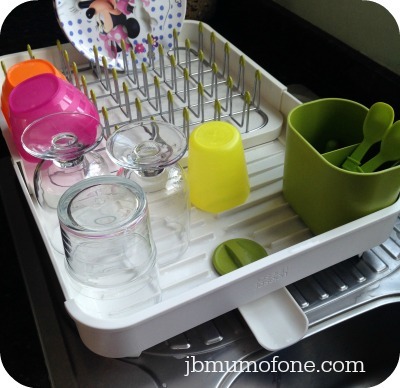 I have a similar issue as I don’t have any dish rack and just balance things up precariously! Oh I like the look of this! We’ve got a Joseph Joseph washing-up bowl. We actually don’t have a dish rack because we use the dishwasher, but when we do hand wash I never know what to do with it! Our dishwasher broke and I realised we don’t even have a dish rack, must address that! THIS! I NEED THIS! I’ve had such a nightmare since we did our kitchen and I bought a new dinner service where the plates wont stand up in our dishrack – flipping things keep falling over and breaking. Love Joseph Joseph and have some JL vouchers to use so will take one of my awkward plates and check it out! Hi, I have a question, if you don’t mind. How do you get products sent to you for free? I understand you have to review and this is something I would love to do. Please can you tell me how I can register my interest? Thank you.